Rick Funk has proudly reached the 54 year mark. He has been with the family business for over 40 years now. He started part time in the used vehicle business with his dad nearly 40 years ago. Then in 1976 the family acquired the Toyota franchise and it has been in the Funk family ever since. Out of the approx 255 stores in Canada we are one of the oldest Toyota dealerships. Rick is also very involved with lots of charities and community events. I am very proud of my staff and I work closely with all of them whether it is professionally or personally related, their views mean a lot to me. We promise to deliver what we say and on behalf of my staff and the Funk family we hope that if and when you try us your experience will be a pleasant one. If not please feel free to call or e-mail me so that we can make it right. Len has been with Funk's Toyota since 2000. He is married and has 1 daughter. He enjoys spending time with his family and playing various sports. Charlene has been with Funk's Toyota since 2000. She is married and has 2 children. She enjoys spending time with her family, shopping and golfing. Lisa has been with Funk's Toyota since 2014. She is married and has 3 sons. Lisa enjoys reading and spending time with with her family. Janelle is the daughter of RIck Funk and married to Nick Dawson. She enjoys spending time outdoors and anything dog related. They have 3 fur babies; Tundra, Marley and Rusty. Rachael joined Funk’s Toyota in March of 2018. In my spare time I enjoy capturing the beauty of people and the outdoors through my camera lens. Also spending time with my friends and family! Mark has been in the Retail Automotive business since 1988 with Toyota. He has been making the trip from Winnipeg to Steinbach since 1997. After working at 3 other Toyota dealerships within the Prairie region, he now knows why 'It's Worth the Trip"
His Family, Music, Racing, Fishing, Trains & Automobiles are all passions for Mark. Come and experience the Funk's Toyota feeling of fair pricing & great service. Kelvin is the youngest of four siblings in the Funk family and also a Business Owner. He is proud to work together with all of them (plus brother in law, niece and nephew) in the family business. He and his wife Sheila have been married for nearly 22 years, they have two children currently 13 and 16 years of age and live just outside of Steinbach. 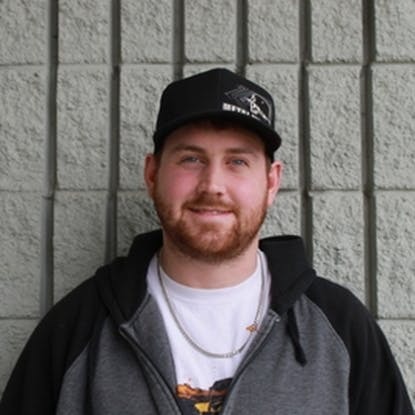 Outside of work he enjoys spending time with family and friends, fishing (passionate is an understatement), hockey, exercising, camping, and watching movies. "Being family owned and operated and surrounded by a team with the same 'we care' attitude is what sets us apart from other dealerships. Come see for yourself why for the past 40 plus years our customers have being saying "it's worth the trip to Funk's Toyota!"" 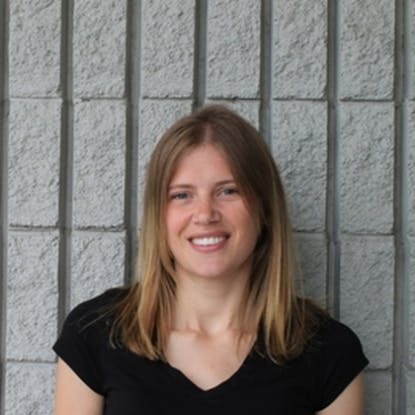 Kelly has worked in the Automobile Industry for many years and has been at Funk's Toyota since 2006. He is the Finance Manager in the Business office. He makes the drive out from Winnipeg everyday to assist you in your financial needs. Kelly loves to travel and go camping in his spare time. Its been so awesome having Yuriy Voloshyn as part of our sales team! From Ukraine, Brazil, USA and now here in Canada, Yuriy is fluent in many languages, including English,Ukrainian,Portuguese and is looking forward to assisting you with your driving needs. Yuriy joined our team in 2012. Peter has been in the automotive industry since 1974. He joined the Funk's Toyota team in 2006. I have a background in sales and advertising within the automotive industry, and I look forward to helping you with your vehicle needs. I joined the Funk's Toyota team in 2016. I live in Ste. Anne and enjoy camping, fishing and spending time with my better half Barry and our 8 children and 3 grand daughters. Originally from the Philippines who has worked for several years in the car industry selling import vehicles, Helston has recently joined Funks Toyota, as he stands by the efficiency and reliability of the brand Toyota. Helston would like to bring in his knowledge, provides you all the information needed to help you make an educated decision in purchasing your vehicle. Helston communicates in English and Tagalog. Meet him in our showroom at Funks Toyota. I have been in the automotive industry for 25 years, the since 2002 I'm proud to say has been with Funk's Toyota. I really enjoy and have alot of fun working with our great team. We have an awesome group of customers who I pride myself in assisting them with their service needs. As for my past times, I enjoy the occasional round of golf, fishing with my friends and family, try to pluck a few tunes on my guitar and I always look forward to the start of the NFL season. Go Colts! I've been with Funk's Toyota since 1991. I have been in the automotive industry for a total of 25 years. My past time hobbies include working on ATV's, snowmobiles, cars and trucks. I also love my dogs. Crystal joined the Funk's Toyota team in 2011. Married to a wonderful husband, with 2 beautiful children. I enjoy spending time outdoors with my family. I also love to read and cook. 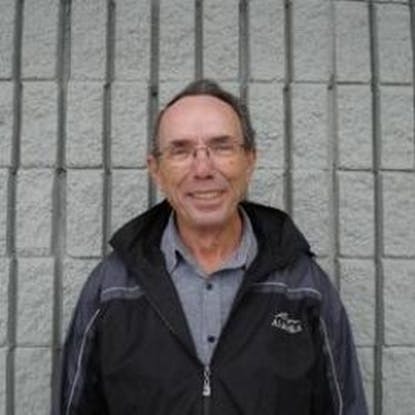 Reg has been working in the Service Department since 1988. He is one of the Managing Owner/Business Partners. Mark is married with two kids. His hobbies include playing guitar, online flying simulation and is a beginner pilot. He joined the Funk's Toyota team in 2006. In his off hours he surfs the net & plays video games so he can keep up to his 9 grandchildren. he has almost mastered the TV remote! Every morning when looking in the mirror he reminds his wife that he is a Good Look'n Guy. I have a small family, just eleven kids. My hobbies are fixing cars, building houses, playing guitar and making something good for people. I began working at Funk's Toyota in 2001. 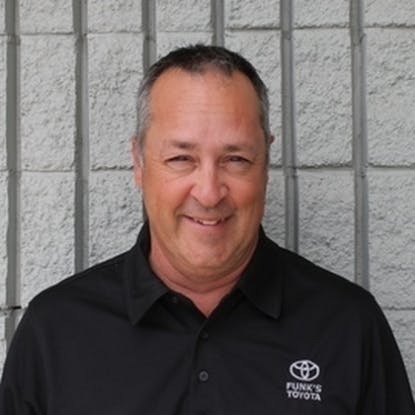 Keith has been employed at Funk's Toyota since 2009. He is married and has 1 child. Another friendly Funk's Toyota employee. Jason has been with Funks Toyota since 2009 and loving it. Jason enjoys watching hockey and working on classic muscle cars. Eugene started at Funk's Toyota in 2014. He is a 4th level apprentice. He has two children. He works on almost anything that has an engine. Nick is the son in law of Rick Funk, married to Janelle. He loves to fish, wakeboard, mountain sledding, snowboard, dirt bike racing, snowmobiling and of course I can't forget about their 3 dogs, Rusty the 3 legged dog from Mexico, Tundra their golden lab and Marley. Nick has taken over the detailing store. Rick is married with 2 children and lives in the La Broquerie area. He enjoys being in the outdoors either camping, fishing, quading or hunting. and is glad to help you out when ever he can. Rick has been at Funk's Toyota since 2006. Kind , courteous and on time! Been driving for us since 2013.